Nothing is perfect but we should strive for Excellance. The Edge is my all time favorite kite and I don't have any interest to try North's but It would be nice if Ozone tried a few different LE materials striving for Excellance. The LE material is new as well. Much excellEnce. Many improves. So perform. Wow. ... just wondering, how do you know this? To Puetz: I found a microscopic 1/3 of an inch cut in my 10M Edge 3 weeks ago while rolling up my kite at the end of a session. No idea how it happened but the cut looked like it was done by a razor blade. Another kiting buddy has experienced the exact same thing with his 11m Edge 3 times on the LE which made him switch back to Cabrinha's. The Edge is a unique kite with a number of qualities that other kites don't seem to be able to match: Bar Pressure, Amazing stability, Great Aacceleration and jumping is off the charts. So, the LE issue is the price we have to pay or return to more durable kites and get sore elbows And give up on the other great attributes of the Edge. SORRY.....need to read more closely. I think it's only the Panel material getting an update to Technoforce D2 but we will know for sure as the kites hit the dealerships. The leading edge material is a completely different brand, and is the same brand as the D2 cloth, as far as I know there are no other kites being made with Teijin leading edge dacron. All other brands use the Dimension Polyant cloth use on all Ozone kites up until now, or they use a copy of this cloth made in China by Cousins, or in Cabrinha's case they use a custom made leading edge material. There is no difference between the dacon used on current Edges, C4's Cats and Reo's, and I'm not hearing about cuts that appear for no reason. No offence meant, but if a cut appears, that you have previously not noticed, it did not just happen by itself, it was definitely not caused by inflation pressure, but it most certainly was caused by something your kite scraped over or against, that you simply did not see. I'd suggest that it could have happened in the last session or even several sessions ago. The Dimension Polyant dacron is very strong and tough, but the new Teijin dacron is better and thats why Ozone are changing its part of their Kaizen philosophy, always improving. The Edge itself is different, it is a new design, but based on the existing overall platform. There are real differences that regular Edge riders will feel, more stability, better upwind, better boosting increased durability and longevity. I don't know where some of the comments are coming from as the kites only just started shipping, we will have our first batch next week. Pictures of the cut and location please. I will take a photo of the cut on the 10M Edge: now repaired which will be seen in the photo. 2 days and still no photo??? Can't wait to demo the new one! My friend has the exact same tear on his 15M Edge only closer to the center strut. I'm not trying to bash Ozone, I love the kites, but at my age I have not reason to BS anyone. Also, know of 2 other local Ozone kiters who had their LE explode both off of a seam - one as it was caught, above the beach, while landing. **** happens but I can't believe Ozone is not aware of product issues like this, Maybe the new 2014 material on the LE and panels are in response to these issues. 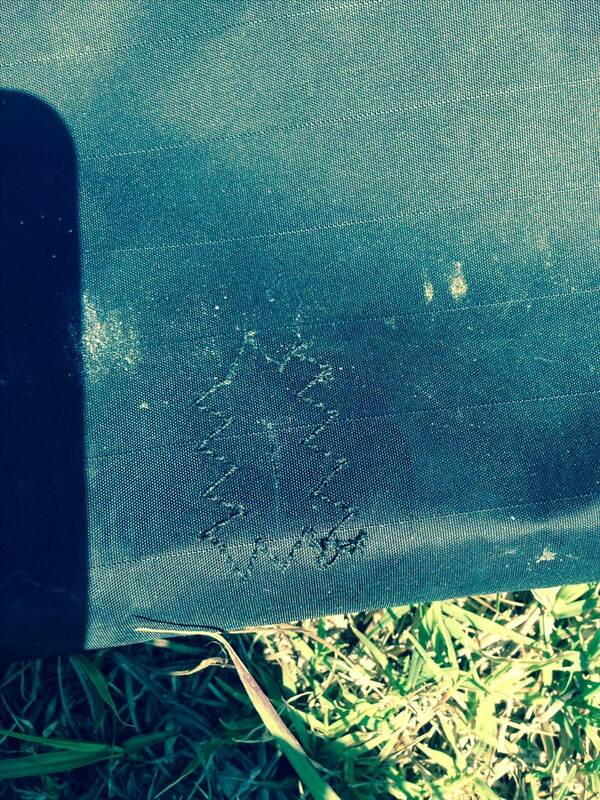 That looks like an external cut to me. I would inspect your launch/land spot man. If several others have had the same looking cut It may be a something at your local causing it. Thanks, we are being overly cautious these days launching and landing but it would be a relief to find out the cause. Irrefutable comment there from the plum man who kites regularly at your beach. He kindly re posted your photos in case people didn't know what he was referring to. He also knows your weight to the nearest ounce and what colour your wetsuit was on the day. Now all you need is eppo's input and the mystery will be solved beyond any reasonable doubt. The cut was definitely caused by something that your kite landed on or during a sliding type self launch, I think you would agree yeah? Anyway, this material, Dimension Polyant fuse bonded dacron, made in Germany was regarded as the best you could get, best in terms of shear strength and abrasion resistance, and I don't see issues with in a general sense. Many other brands use it too. There is a cheap china made copy of the material but its quite easy to spot, especially as the kite ages, the copy stuff gets softer much more quickly, and its just not as strong top start with. The new Teijin leading edge dacron must be better otherwise Ozone would not choose to switch to it. My first 2014 Edges arrive next week, I'll try to post some pics to show the difference then. Regardless, all these LE cloths are strong up until they come in to contact with something sharp, and if something on you local beach was sharp enough to slice your 2013 Edge like that, I reckon it would slice any brand of leading edge cloth. Easy fix, though, even if the bladder was nicked, we just pull the bladder out the centre opening and patch with tear aid, good as new in a moment. The cut was in a place that we see a lot of damage to kites of various brands, we do around 1000+ repairs a year, the location screams crash on beach or an unintended harder than expected self landing. Not really in the right place for self launch damage (but anything is possible in my experience). Yep. It is interesting that some of the biggest farktards on the forum have a low post count. Have they come on here and instantly been offended at some of the more frequent posters? I think knot. They are most likely some longtime members alterarrsewhole ego's. KitePower - it would be helpful to get a review on the new Edge and what they have changed on LE and Panel materials. I guess the answer is launch and land with care or expect some LE damage ?? I self launch and land all the time with my edges and i will agree that they aren't the most beefed up kites for doing so. i have just used some stick on dacron tape to cover the stitched seams on the LE which were showing roughing up of a few stitches. on the 2013 edges the first 4 seams from the tips have bumpers sewn on ...the next 4 and the centre seam dont have any protection which is a shame....would be great if ozone could/would just "bumper" up all the LE seams. I set my kite up at the edge of the window and then get it to fill and roll over and take off...i'd say i get about a 75% success rate doing this but the other 25% the kite does drag a little into the window and then fills and rolls over...i think this is where the stitching gets rubbed. 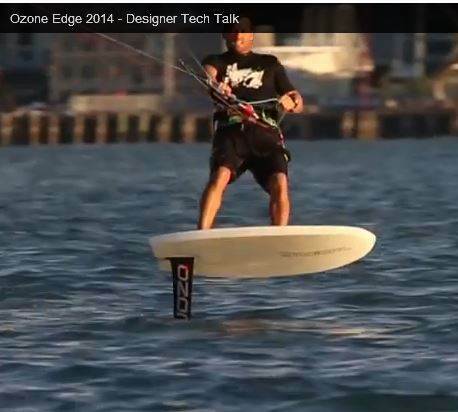 Kite Schmite...When is Ozone bringing out the hydrofoil in the video? Try moving upwind of your kite more when you are self launching so that the kite will be in a position that most would describe as "hot" or back from the edge of the window is another way of putting it. This way the kite will simply roll (quickly) and as soon as its leading edge is pointing upwards and toward approx 9-10 o'clock let go of the bar or at least push it out. This way the kite launches with minimal power and will barely pull you, but more importantly for the sake of longevity of your kite, it will not slide along the sand. I've always said if your kite slides, you are doing it wrong. 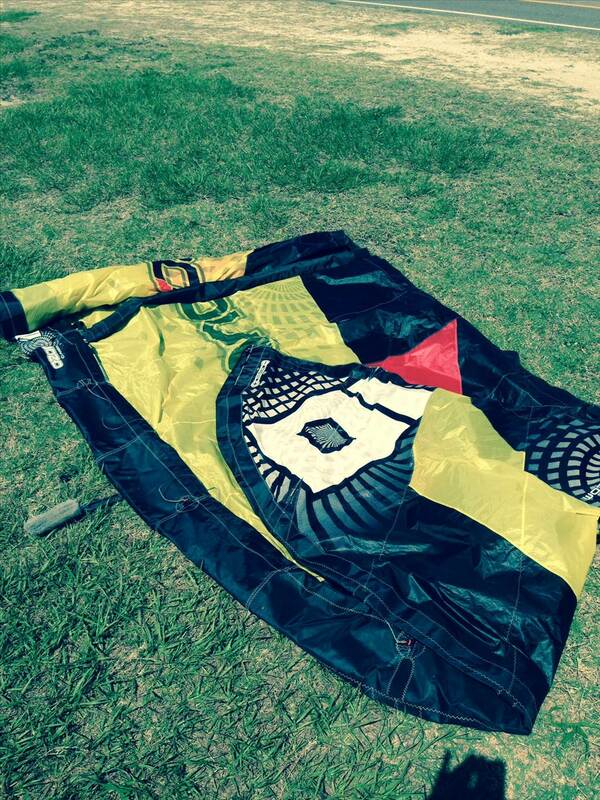 People who call it slide launching are doing it wrong and destroying their kites.